Robert Schreck (/ʃrɛk/; born February 2, 1955) is an American comic book writer and editor. A co-founder of Oni Press, Schreck worked for long stretches at both Dark Horse Comics and DC Comics. He is currently editor-in-chief of Legendary Comics. In 1977, Bob Schreck began working for Creation Entertainment running conventions around the country, where he got to know most of the era’s comic book professionals, and met aspirants and up-and-comers such as Matt Wagner, who has called Schreck "a major force in the comics industry." In the early 1980s he worked in marketing at Marvel Comics. In 1985 Schreck and his future wife (now divorced) Diana Schutz were hired as, respectively, administrative director (in charge of marketing and publishing) and editor of Comico Comics. Under their stewardship Comico rose to the third best-selling comics publisher, after Marvel and DC. After a brief stint at Graphitti Designs, Schreck worked at Dark Horse Comics from 1990-97, where he served as marketing director, editor and group editor. During this time Dark Horse became the third best-selling comics publisher in the country. 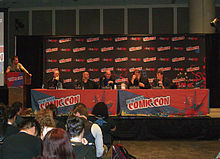 As editor, Schreck brought several talents to a wider audience, including Mike Allred and Paul Pope, who credits Schreck as an important factor in his career, and was the editor of, among other titles, Frank Miller's Sin City, The Big Guy and Rusty the Boy Robot, Madman, Art Adams’s Monkeyman and O'Brien, and the anthology title Dark Horse Presents. Schreck was later instrumental in compelling Frank Miller to work with director Robert Rodriguez on a film version of Sin City. He left Dark Horse in 1997 and shortly thereafter co-founded Oni Press with Joe Nozemack. Oni's goal was publishing comics and graphic novels the founders would want to read. Unsatisfied with the material that was dominating the industry, they believed firmly that sequential art could be used to tell virtually any story. Oni titles Schreck edited include Kevin Smith's Clerks and Jay and Silent Bob comics, Whiteout, Bad Boy by Frank Miller and Simon Bisley, and the award-winning Oni Double Feature. After leaving DC in January 2009, Schreck joined IDW Publishing as a senior editor, where he also wrote the comic book series Jurassic Park: Redemption. In 2011, he was named editor-in-chief of Legendary Comics, with whom he brought out Holy Terror by Frank Miller, The Tower Chronicles by Matt Wagner and Simon Bisley, Shadow Walk by Mark Wade and Shane Davis, Annihilator by Grant Morrison and Frazer Irving, and Cops for Criminals by Steven Grant and Pete Woods, as well as tie-ins to Warcraft, Pacific Rim, Godzilla, and King Kong. Schreck credits his editorial philosophy in part to the influence of Archie Goodwin, explaining: "I try to provide very fertile topsoil. A place for these people to take root and grow... a certain amount of stepping back and compassion, just being able to listen to what it is... many times the writer or the artist you’re working with, they’re not quite sure what it is they want to say at this juncture. So you’re there to hear things that even they’re not picking up on and help them see it." Bob Schreck grew up in Levittown, New York. He resides in Milwaukie, Oregon with his husband Randy. ^ http://prismcomics.org/profile.php?id=47 Schreck profile Archived July 27, 2011, at the Wayback Machine, Prism Comics (April 10, 2008). ^ "Jurassic Park Story Continues in Print Form from IDW". Wikimedia Commons has media related to Bob Schreck.